« VALIANT Gets Fired Up for PHOENIX COMICON 2013! The Twilight Zone and other similar science fiction that fuels late night college-like conversations is missing from the mainstream. So, readers are forced to dig a little deeper to find something that is philosophical, creative, unique and top-notch storytelling. Scrapped: The Dead Man fills exactly that role. Yeah, it’s one of those smaller, indie books with art that is “different” from the mainstream but it’s really good, well done and something you’ll be thinking about well after you’ve closed the back cover. James Mitchell writes a strange story in Scrapped: The Dead Man. 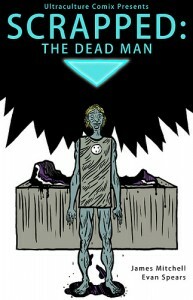 It’s about a guy that wakes up dead on a cold slab in a null, clinical place, and confronted by two beings that claim their job is to recycle his soul. And well, that’s just the beginning. 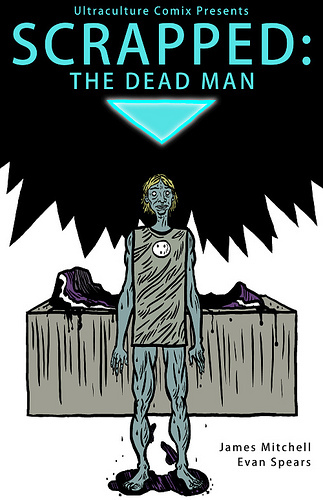 Scrapped: The Dead Man is very strange and fun story about dialogue and big ideas. There’s very little “action” in this book but in the end, it has an action-packed conclusion that makes this short story pay off. Evan Spears’ art in Scrapped: The Dead Man, while not what The Big 2 publish, it’s effective and smart storytelling with excellent use of page and panel layout. Spears makes a book about dialogue and big ideas visually appealing, not only in his use of the page/panel but also in his character design and ability to use iconic images that enhance the story in a way that can only happen in comic books. Spears also does a great job of establishing visual queues throughout Scrapped: The Dead Man that make it a compact and complete book. If you’re itching for some deep, science fiction, Twilight Zone-type reading, give Scrapped: The Dead Man a couple reads – it’s worth your time and money. Scrapped: The Dead Man can be bought online here. This entry was posted in Columns and tagged alternative comics, Evan Spears, indie comics, james mitchell, Scrapped, The Dead Man, twilight zone, Ultraculture Comix. Bookmark the permalink. Follow any comments here with the RSS feed for this post. Post a comment or leave a trackback: Trackback URL.